Not all hard rock ‘guitar heroes’ that emerged during the late ’80s-early ’90s were instrumental solo artists, as evidenced by Dream Theater’s John Petrucci. Born on July 12, 1967, and raised in Kings Park (a town located in the suburb of Long Island, New York), Petrucci got serious about guitar at the age of 12, and developed a liking for prog rock and heavy metal (Rush, Iron Maiden, Yes, and later, Metallica and Queensryche). But it was the technically demanding guitarists, like Yngwie Malmsteen, Allan Holdsworth, and especially, Steve Morse, who inspired Petrucci the most. 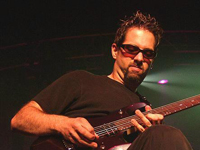 Enrolling at Boston’s Berklee College of Music, Petrucci befriended such fellow classmates as bassist John Myung and drummer Mike Portnoy, who would serve as the core for what would eventually be known as Dream Theater. Enlisting keyboardist Kevin Moore and singer Chris Collins, the quintet began playing and recording under the name of “Majesty”, until they realized another group owned the rights to the name. Hence, by the late ’80s, “Majesty” had changed their name to Dream Theater, and Collins was replaced by Charlie Dominici. The Dominici-led version of Dream Theater lasted for a single album, 1989′s When Dream and Day Unite, before his exit early in the new decade. Despite building a sizable following in the New York area, Petrucci and his bandmates were little known elsewhere, but this all changed with the arrival of new singer James LaBrie, and their sophomore effort, 1992′s Images and Words. Despite a changing of tastes with most rock music fans (towards the sounds of Seattle), the album proved to be a breakthrough commercial success (as the song “Pull Me Under” became a surprise hit on both MTV and rock radio). Arguably, nobody in Dream Theater benefited the most from the sudden wave of success than Petrucci, who was instantly recognized as one of the most technically accomplished guitarists in all of hard rock — winning polls in guitar publications the world over, as well as being mentioned in the same breath as such six string wiz’s as Steve Vai and Joe Satriani. Like Vai and Satriani (who also hailed from Long Island, as well), Petrucci became affiliated with the Ibanez guitar company (even lending his name to his own signature series), before switching to the Ernie Ball company later on, and once more, launching his own signature series.